The Gates Mills Garden Club is pleased to present Through the Garden Gate Garden Tour, an outstanding event featuring private gardens, speakers, a garden-inspired boutique and for the first time ever, an artist capturing on canvas the serene beauty of a summer garden. Our “Plein Air” artist, Mary Ann Boysen, has her own distinctive style just as each garden has its own distinctive qualities. “Plein Air” is a French term for painting scenes on location in open air. You are invited to watch the magic unfold as she paints one of the gardens at Esquire’s Cottage in Gates Mills. Also NEW for 2019! This year the Garden Tour is welcoming speakers to the Garden Tour. On Friday, John Reinier, Wetland Ecologist for the Cleveland Metroparks, will present “Natural Gardens along the Chagrin River” and will include a walk-through of the Gates Mills Arboretum that runs along the river. For over 80 years the Gates Mills Garden Club has been the steward of the Arboretum, a riverside park at the foot of the Pedestrian Bridge in the heart of the Village. On Saturday, Marcia Anselmo, President of the Gates Mills Historical Society, will present information on the interurban rail service that once ran through the center of Gates Mills. The Garden Club would like to invite you to participate as a sponsor. Regardless of the weather, hundreds of people attend. Luncheon and Grand Tour options for the outing make the gardens appealing and accessible. 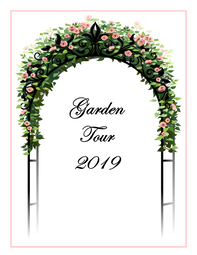 The Garden Tour receives rave reviews in print media including The Plain Dealer, The Chagrin Valley Times and Sun Newspapers as well as on popular radio stations. The Garden Club is very proud of the professionalism it brings to this enterprise and I am confident it will reflect well on your business. go towards scholarships, education, beautification projects and more. We hope you will consider our invitation. If you have any questions whatsoever, I would be more then delighted to answer them. I can be reached at gmgcGardenTour@gmail.com. We are looking for raffle donations. Below is a link to Gift in Kind form to accompany your donation. We are looking for gift certificates, garden related items, wine, themed baskets, etc. Every other June the Gates Mills Garden Club holds a Garden Tour that showcases a carefully selected collection of lovely private gardens in historic Gates Mills, Ohio. The 2019 Tour is June 21st and 22nd. Friday, June 21st - 10 a.m. to 4:00 p.m.
Saturday, June 22nd - 10 a.m. to 4:00 p.m. The Vendor Boutique is open 10 a.m. to 4:00 p.m. during the Garden Tour. No ticket is required to visit the Boutique. Tour guests visit private gardens around the Gates Mills community as volunteer hosts and hostesses present garden facts of interest. Tour guests provide their own transportation between stops, parking at the curbside or nearby. The program includes a map and information about the featured gardens. There is also an opportunity to patronize our vendors at the Boutique and witness our Plein Air artist, Mary Ann Boysen, capture the beauty of one of the many gardens of Esquire’s Cottage, both located at the Garden Club Property at 1280 Chagrin River Road in Gates Mills, Ohio. This year the Garden Tour is welcoming speakers to the Garden Tour. On Saturday, Marcia Anselmo, President of the Gates Mills Historical Society, will present information on the interurban rail that once ran through the center of Gates Mills. A special luncheon will be served at the private, Chagrin Valley Hunt Club, 7620 Old Mill Rd, Gates Mills at noon on Friday, June 21st only. A buffet including dessert choices and a cash bar will be offered. The Garden Tour with Lunch Reservation ticket is $65. Luncheon reservations must be purchased in advance. Founded over 100 years ago during the region’s booming industrial era, the Hunt Club’s history began on the banks of the Chagrin River in a rustic tavern that served as a meeting house for a handful of ardent fox hunting enthusiasts escaping the city bustle. Now, the modern Chagrin Valley Hunt Club offers fine dining, event and meeting facilities, court and platform tennis, and a newly-renovated outdoor swimming pool on a lush 15 ½ acre campus, which also includes the Chagrin Valley Hunt foxhound kennels and Chagrin Valley Stables horse boarding and riding facilities. These are WILL CALL TICKETS and are not refundable. No tickets will be mailed. You will be emailed a receipt from Paypal. This option includes lunch at the Chagrin Valley Hunt Club only on Friday, June 21st at 12 noon and a Garden Tour ticket. The Garden Tour ticket can be used at any time on Friday, June 21st or Saturday, June 22nd. Reservations must be received on or before June 16th, 2019 at 5pm. This delectable experience is $67.50 and includes a small convenience fee of $2.50. Advance purchase price is $26 and may be purchased online until Sunday, June 16th at 5pm. Tickets are good for admission to the Garden Tour on both days, Friday, June 21st and Saturday, June 22nd from 10am to 4pm. This includes a small convenience fee of $1.00. Tickets purchased the day of the event are $30. Payment may be made by cash, check or credit card. Tickets are good for admission to the Garden Tour on both days, Friday, June 21st and Saturday, June 22nd from 10am to 4pm. During the Garden Tour, tickets may be purchased for $30 by cash, check or credit card. The Boutique is located at 1280 Chagrin River Road in Gates Mills, Ohio. The Boutique is open 10 a.m. to 4:00 p.m. during the Garden Tour. No ticket is required. Complimentary beverages and freshly baked treats are included with all ticket purchases. Proceeds from the Garden Tour fund the Garden Club’s annual scholarships, youth education programs, senior outreach programs, tree planting and community gardening projects such as the bridge boxes. An all-volunteer effort, many men and women donate hundreds of hours toward this worthwhile project. To advertise in our program, please contact us at gmgcGardenTour@gmail.com. The program serves as our roadmap to the gardens and is distributed to all guests.